Easy to set up. Quick scan speed. Much smaller than I anticipated which was a welcome surprise and sits unobtrusively on my desk. Very pleased with purchase and added peace of mind with free 5 year warranty. This compact scanner has scanning speeds of up to 26ppm / 52ipm, even at 300dpi in colour. This, combined with hardware JPEG compression, makes large scan jobs faster to process. Epson Document Capture and Document Capture Pro make it easy to integrate this scanner into your document management system, speeding up workflow and enabling you to capture, convert and distribute scanned information into your document filing systems. In addition, the Pro version for Windows offers barcode recognition and Zonal OCR to help automate document processes, such as file naming and folder creation. 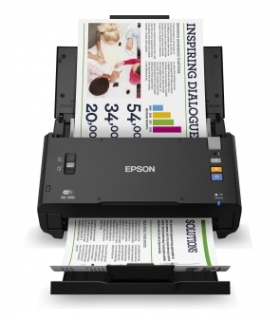 Epson Scan1 offers a wide selection of advanced document imaging features, including text enhancement and automatic de-skew, which help improve efficiency and increase workload output. This model also scans to .docx, .xlsx and .pptx. Scan to your Android or Apple mobile device by downloading the new Epson DocumentScan app from Google Play or the Apple App Store. Wi-Fi, Wi-Fi DirectTM and USB interfaces allow you to conveniently connect to this scanner.